Billy Traft heard the commotion while he was waiting to emerge from the tunnel beneath the TD Garden stands on Saturday night. At first, the 33 year-old Boston cop who chases down gang members for his 9 to 5 couldn’t put his wrapped finger on who— or what— it was making all that racket. Then, someone pointed out that his face was splashed on the jumbo-tron above the ring. It seemed that the whole Garden was screaming his name. At least one whole side of the arena— dubbed the Traft section— was engulfed in ‘Billy’ chants. “It was deafening. When I heard them going crazy, it really made the hair on the back of your head stand up a bit,” Traft said. Billy Traft — wearing green and white trunks emblazoned with the word “Dorchester”— gave his hometown crowd a lot more to cheer about once he squared off with fellow middleweight Joe Powers, also a freshly-minted pro from Groton, Connecticut. Traft dominated the four-round bout, punishing Powers with body blows and hooks. The taller Powers hung tough, though, and survived the beating and earned Traft’s respect. 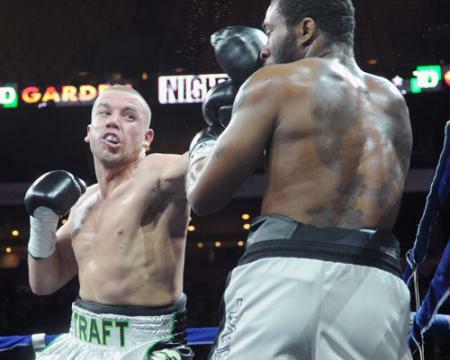 For his part, Traft earned a unanimous victory from the judges and his third professional win. He remains undefeated. 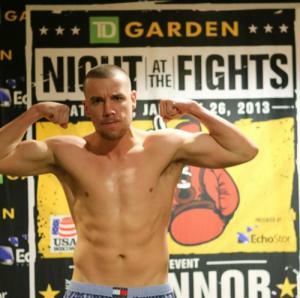 Traft: Confident in his pre-fight weigh-in.“I take my hat off to [Powers], he’s a really tough guy,” said Traft. Marty McDonough, the Uphams Corner native who trains Traft at TNT Boxing in Braintree, was pleased with his protégé’s latest outing. McDonough said he wasn’t surprised to see that Traft had the largest cheering section in the Garden. Traft hopes to fight again— perhaps as soon as this summer. There is talk of a possible event at Fenway Park and Traft, whose last two fights were set at Gillette Stadium and TD Garden— sees a chance to make it a “trifecta” of Boston’s marquee sports venues. Wherever the setting, it had better have room for Traft’s fan base, which was impressive on Saturday night.